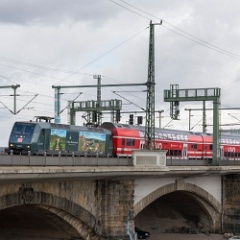 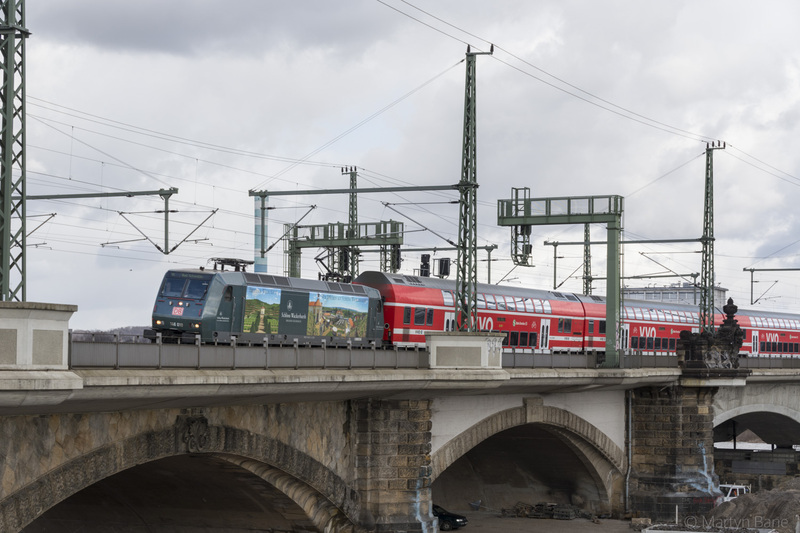 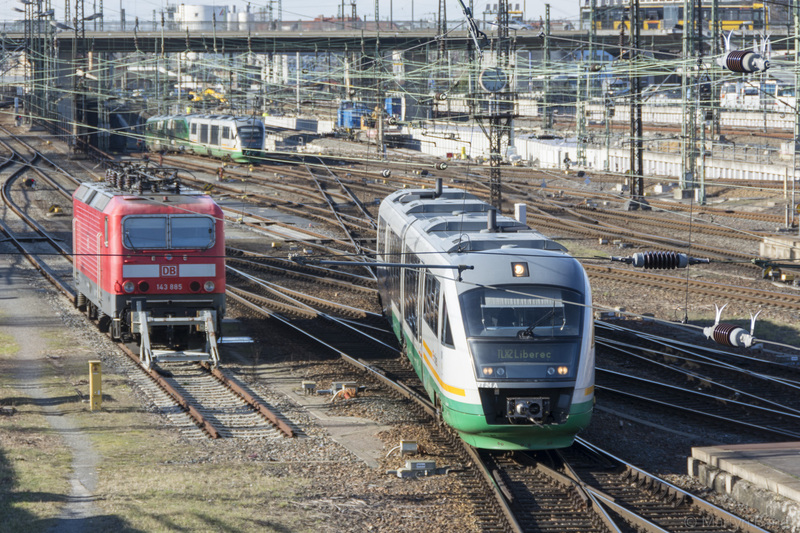 1 Czech 371 002 gets uncoupled from its train, EC 178 from Prague to Dresden. 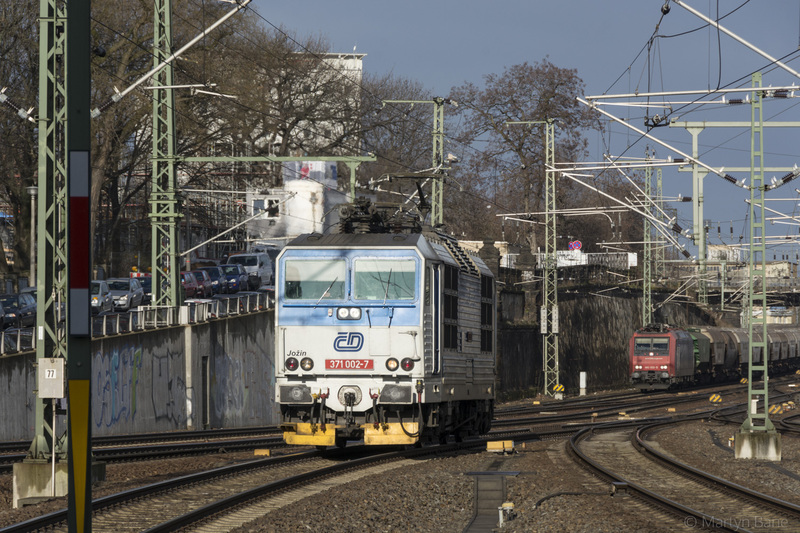 2 DB 101 043 heads towards EC 178, this loco took the train on to Berlin Hbf. 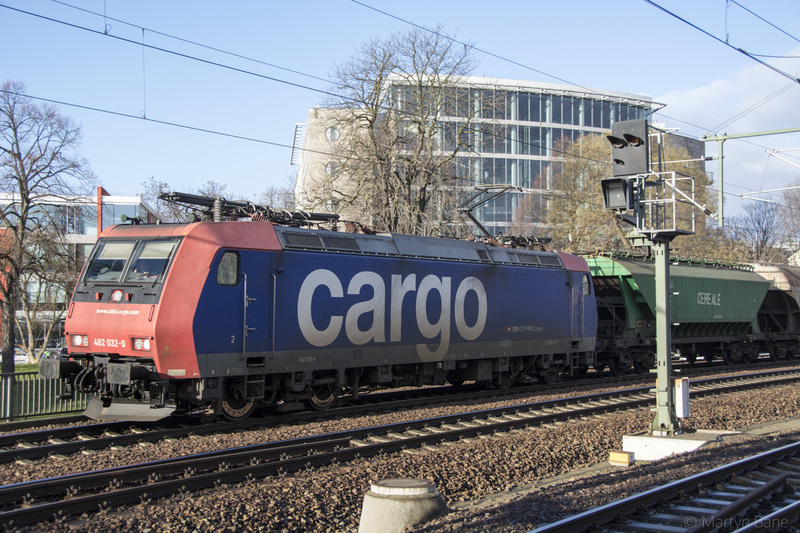 3 CD 371 002 runs through Dresden Hbf whilst an SBB Cargo train approaches on the freight lines. 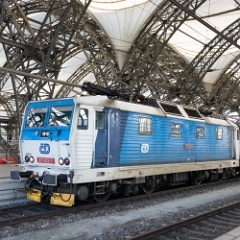 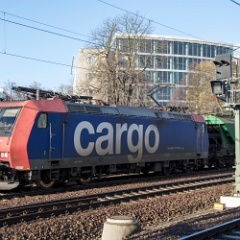 4 SBB Cargo 482 032 at Dresden Hbf. 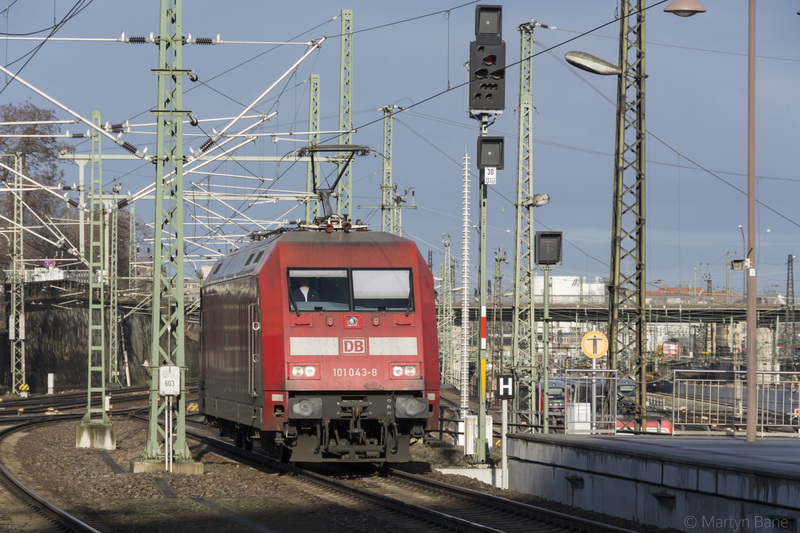 5 101 043 at the head of EC 178, ready to head to Berlin. 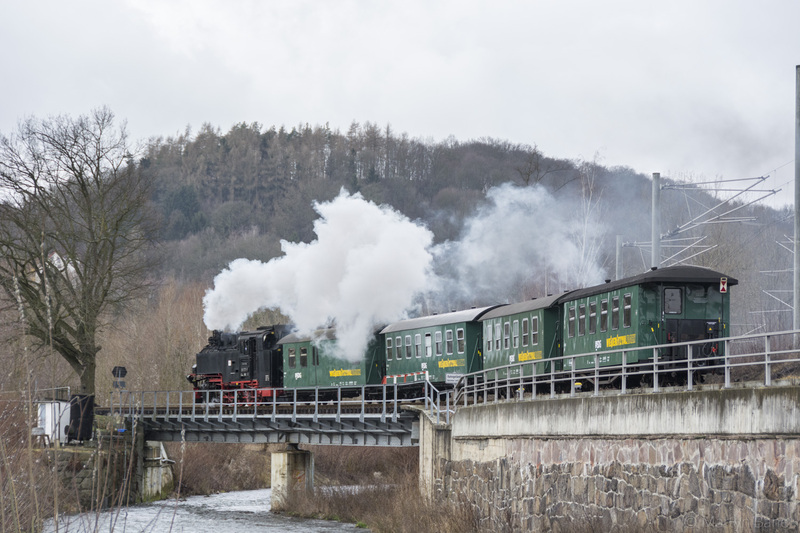 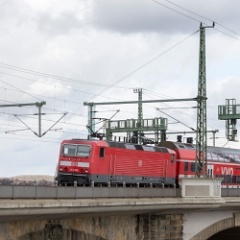 6 At the confluence of the Rote Weisseritz and the Wilde Weisseritz rivers in Freital 99 1771 hauls the short 09:42 Freital Hainsberg to Dippoldiswalde service. 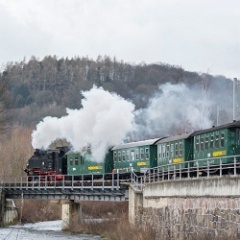 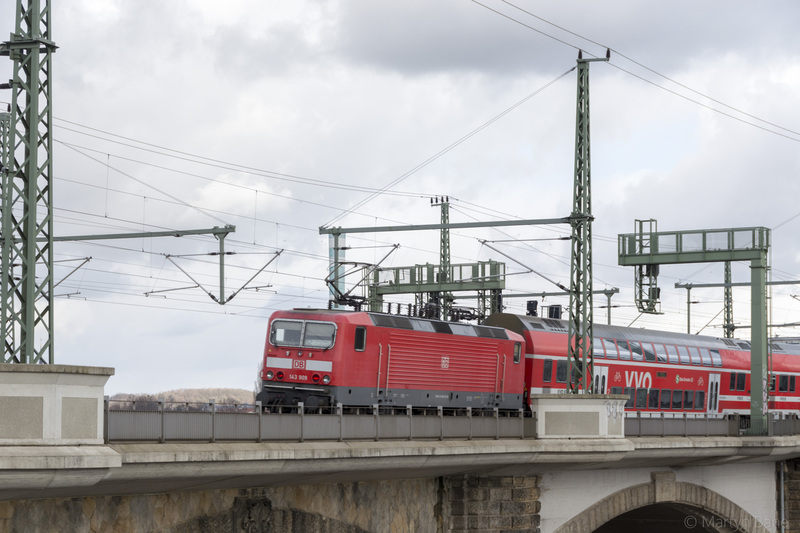 7 99 1771 and train crossing the Wilde Weisseritz. 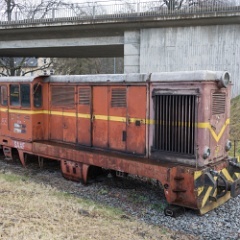 8 A diesel in its correct state, out of use. 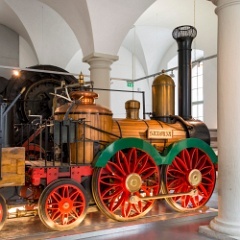 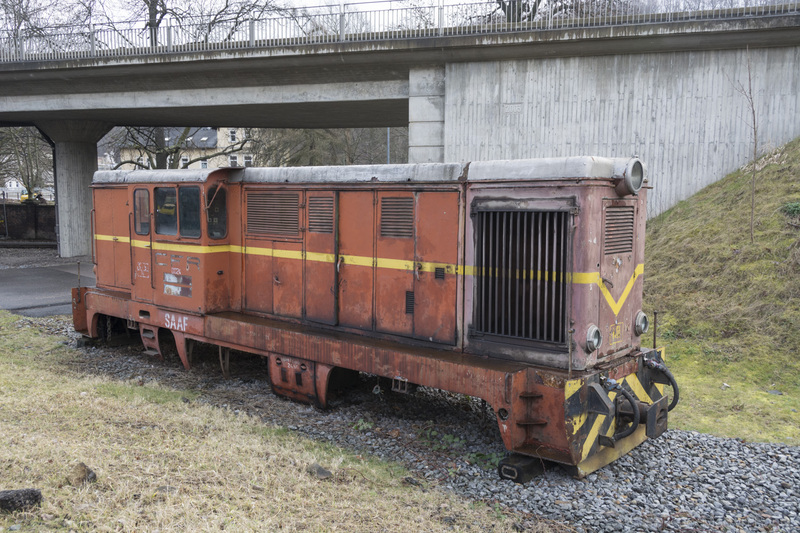 This Romanian 760mm gauge loco is dumped at Freital Hainsberg. 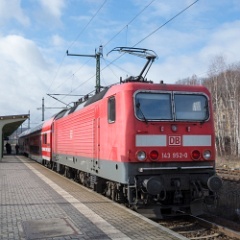 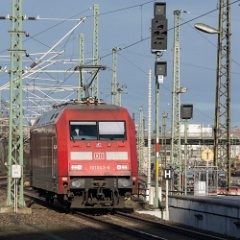 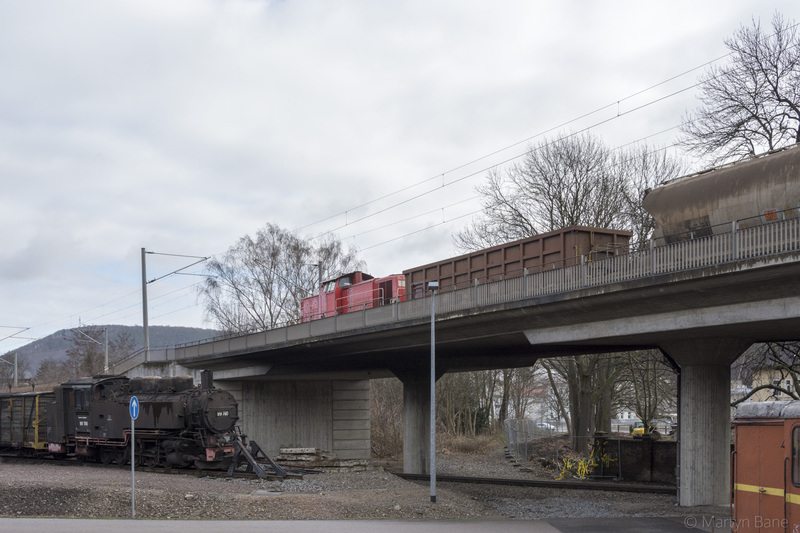 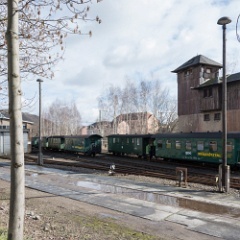 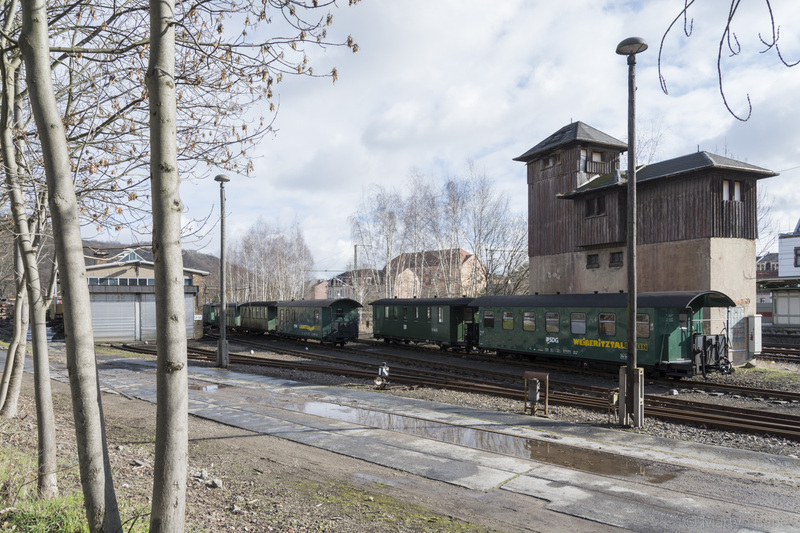 10 V90 294 702 hauls a short freight service past the depot at Freital Hainsberg. 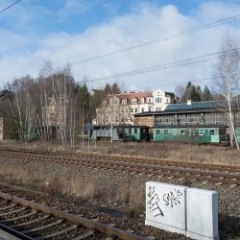 11 Looking down to the narrow gauge facilities at Frietal Hainsberg from the standard gauge platforms. 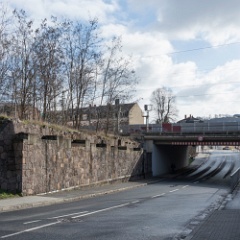 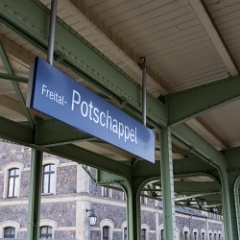 12 Freital Potschappel station, once junction station for the Wilsdruff 750mm system. 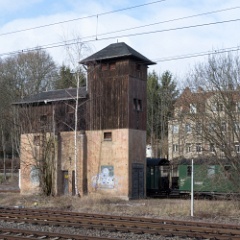 13 Remains of the Wilsdruffnetz station at Freital Potschappel. 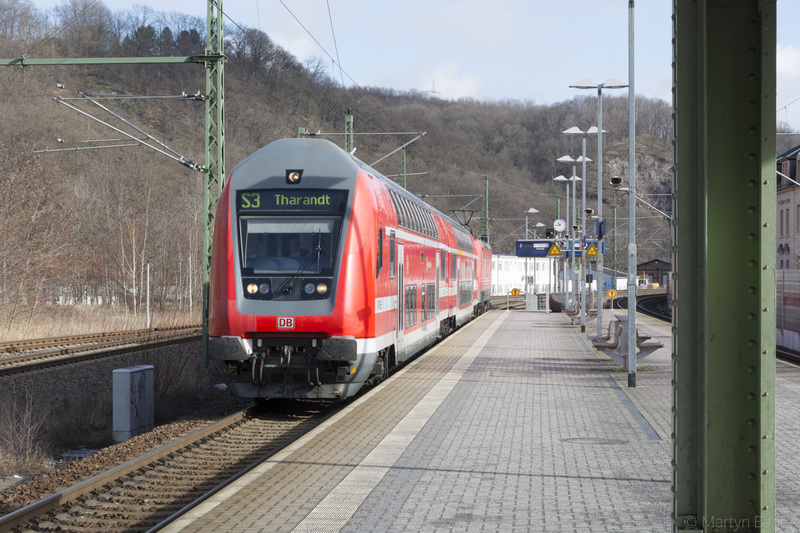 14 Tharandt bound S3 service at Freital Potschappel, this being the 10:37 from Dresden Hbf. 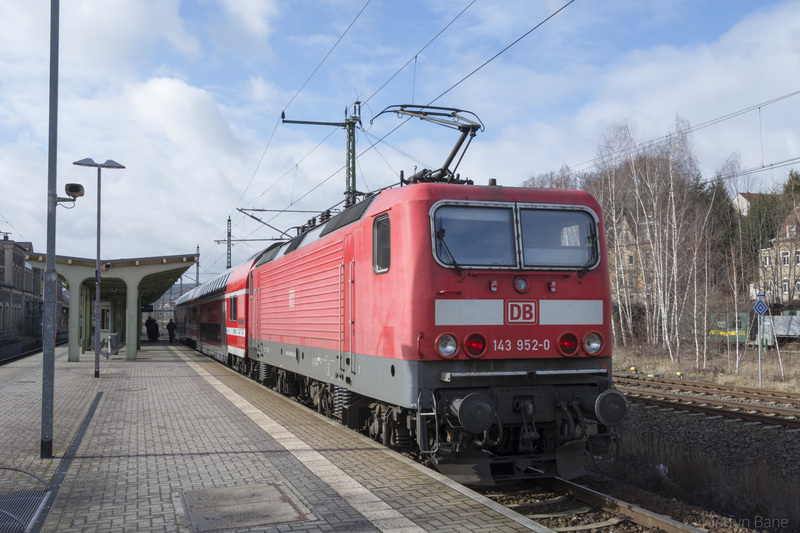 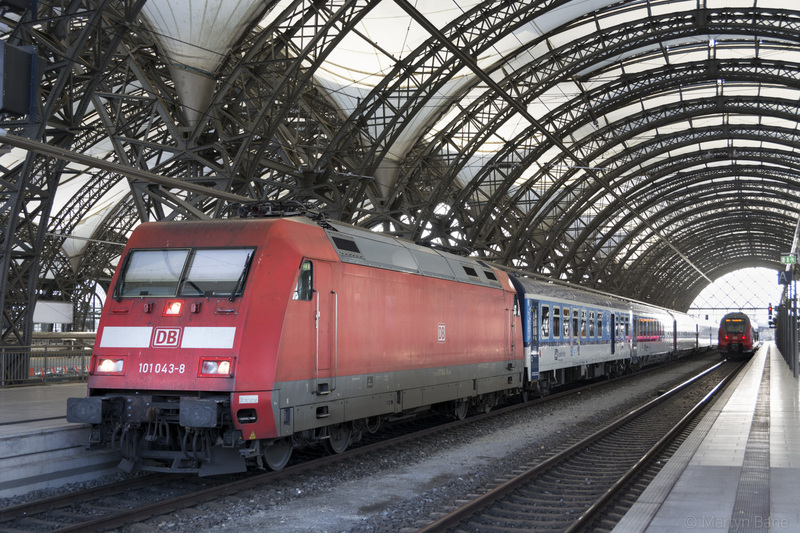 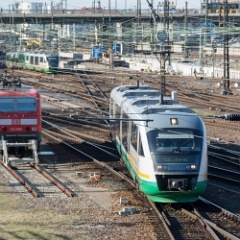 15 And at the read of the 10:37 S3 from Dresden Hbf to Tharandt was 143 952. 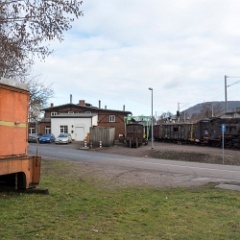 16 At Freital Postchappel the 750mm is still present, the shed being used for carriage overhauls. 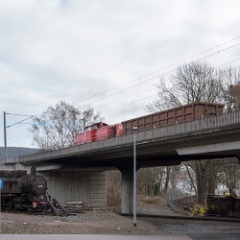 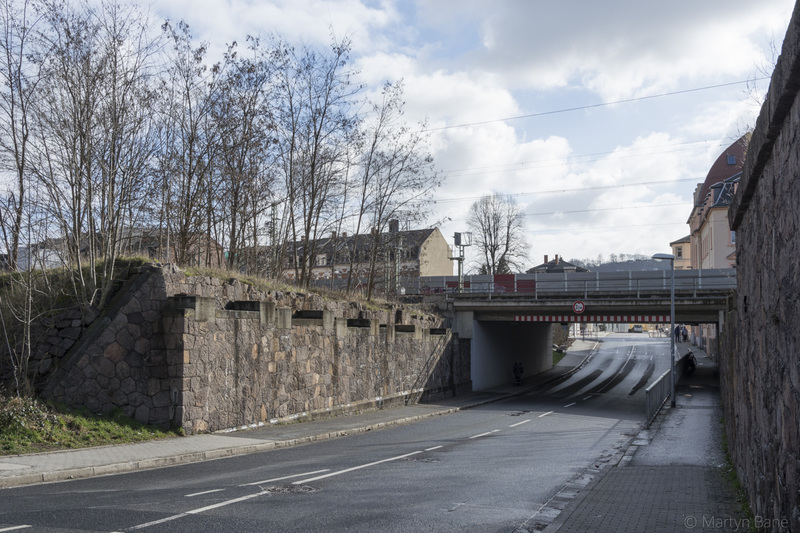 17 The road here at Freital Potschappel used to be crossed by a much wider railway bridge, the removed section carried 750mm gauge tracks. 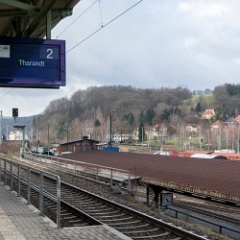 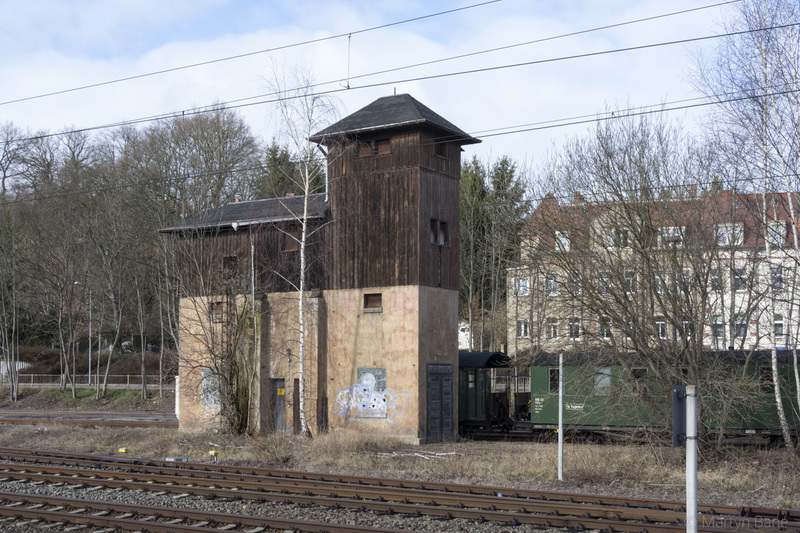 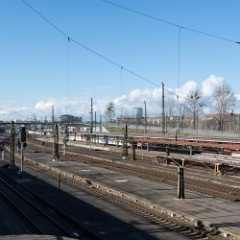 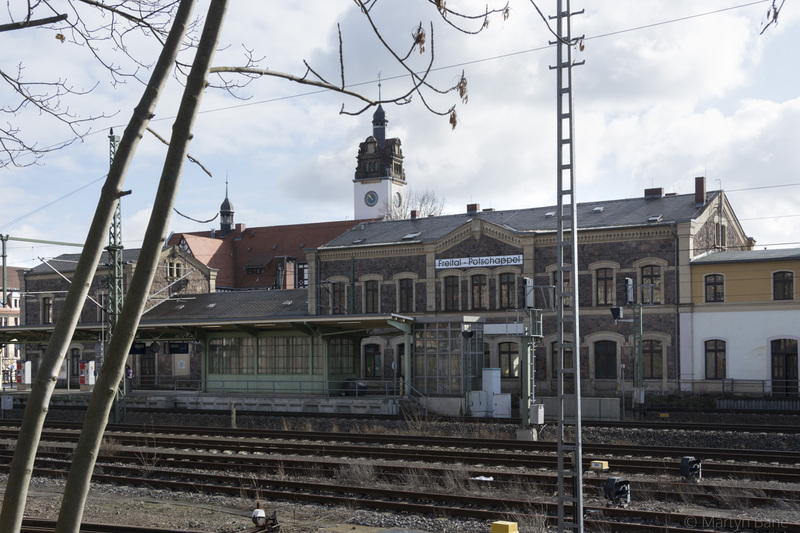 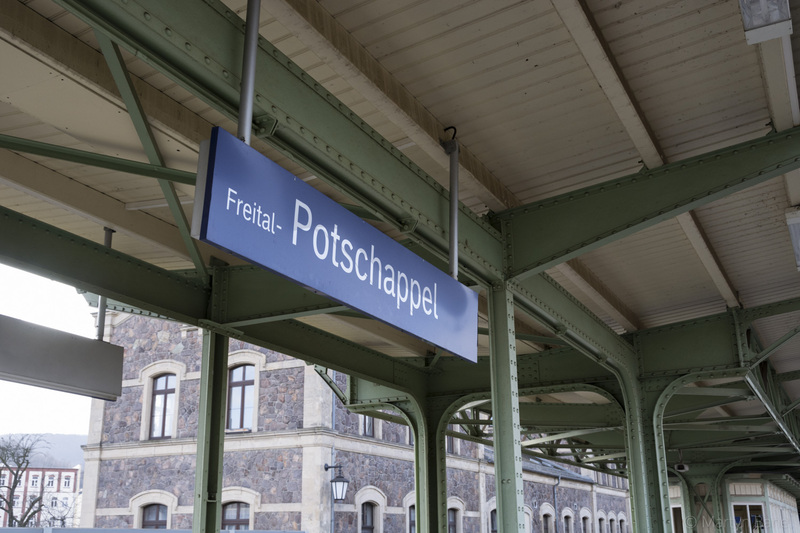 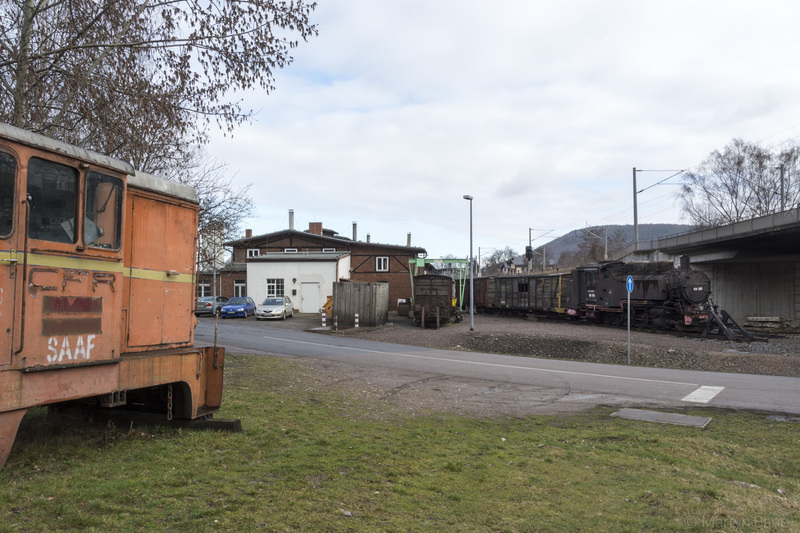 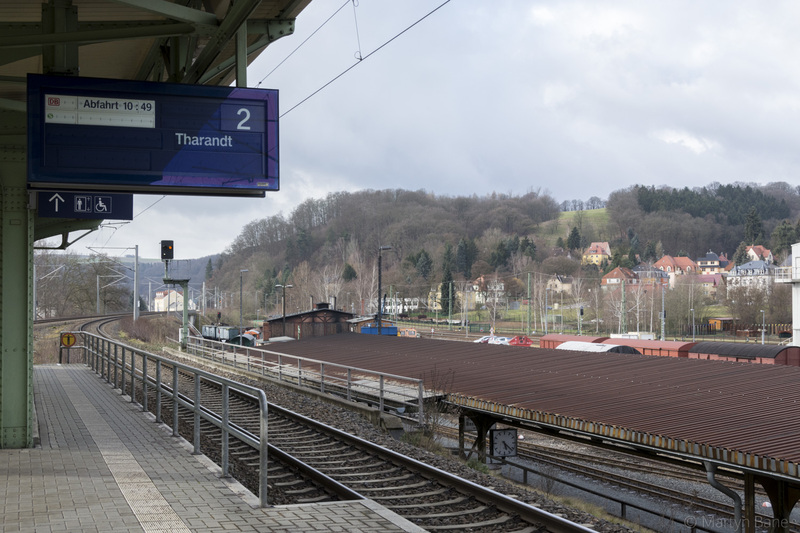 18 Freital Potschappel station, not as important as it once was. 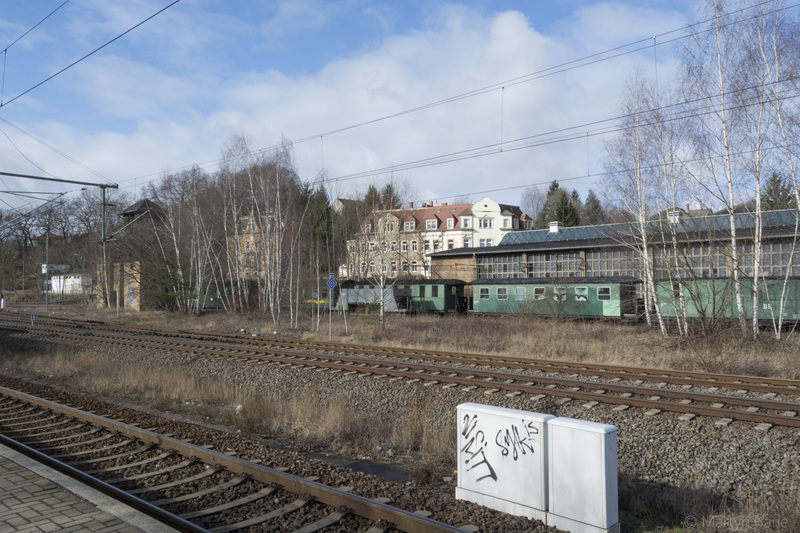 19 The site of the 750mm station at Freital Portschappel. 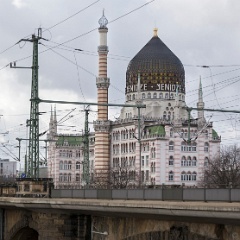 20 The former cigarette factory belonging to Yenidze which is alongside the railway and the Elbe. 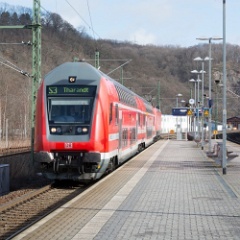 21 146 010 leads the 11:16 Meißen Triebischtal to Bad Schandau service over the Elbe just beyond Dresden Neustadt station. 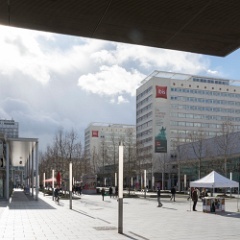 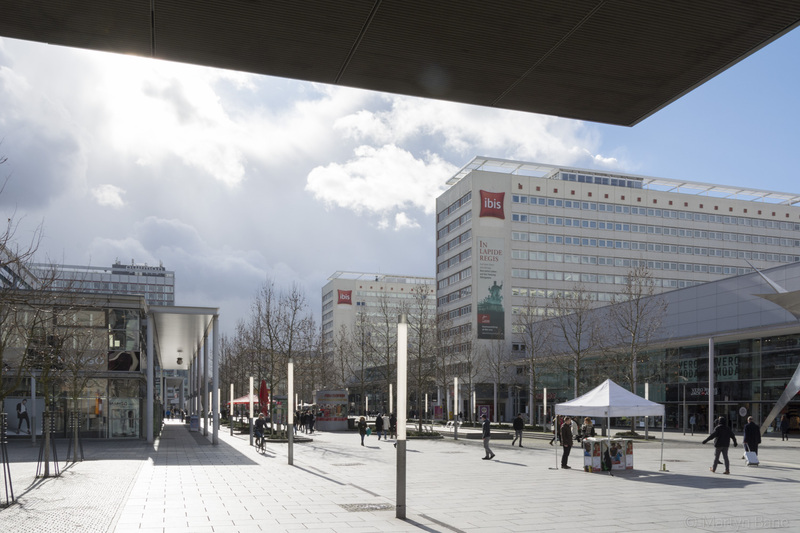 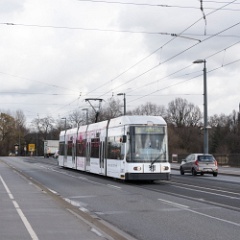 22 An S2 service from Heidenau to Dresden Flughafen passes the Yenidze building. 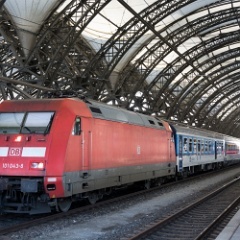 23 143 909 propels the Dresden Flughafen bound S2 service across the Elbe. 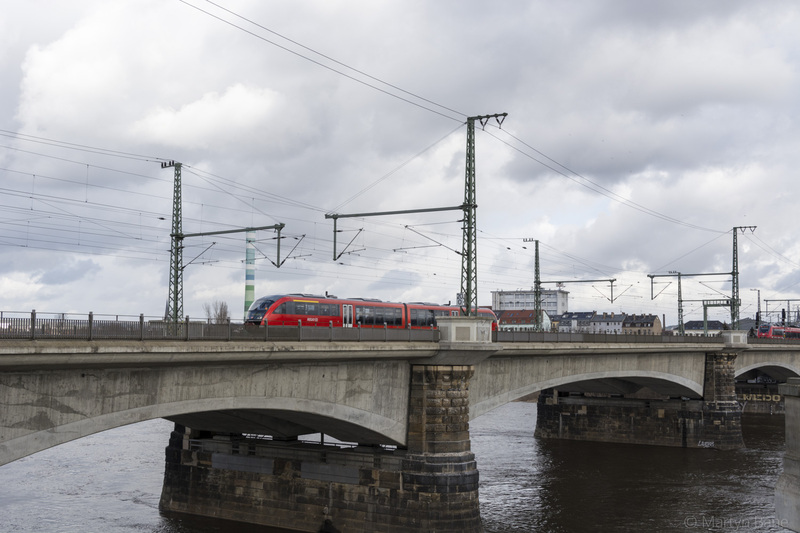 24 A Dresden Hbf bound DMU crossing the Elbe. 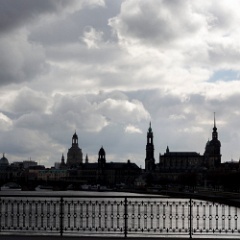 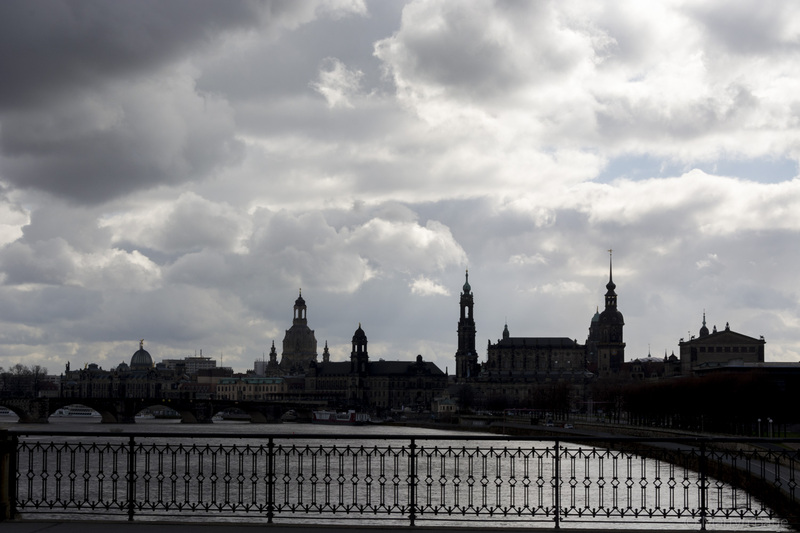 25 Dresden's old city skyline in semi-silhouette. 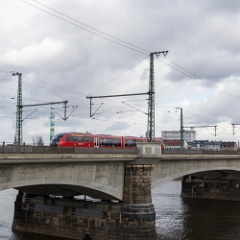 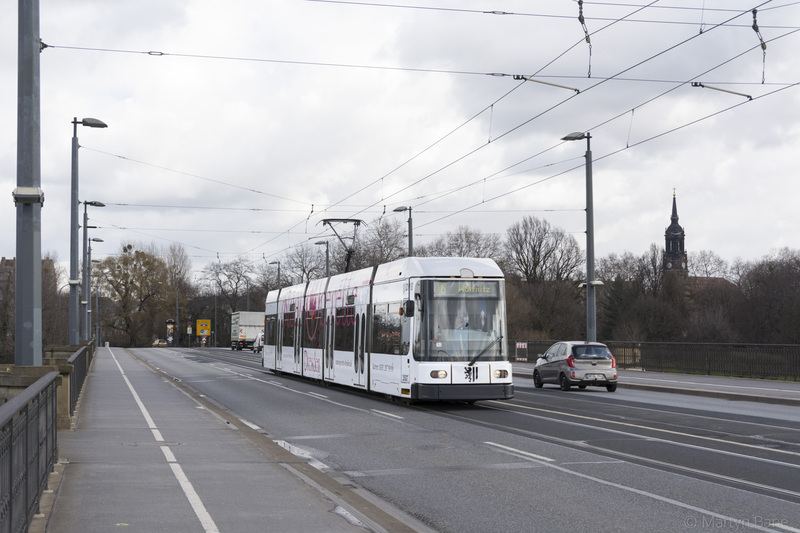 26 Road 6 tram crosses the Elbe on the Marienbrucke. 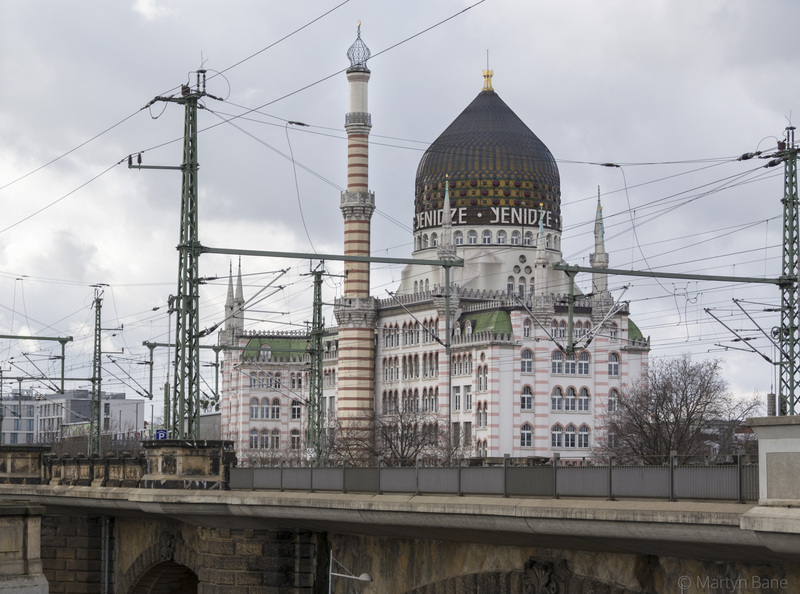 27 Looking along Prague Strasse with two of the three Ibis hotels. 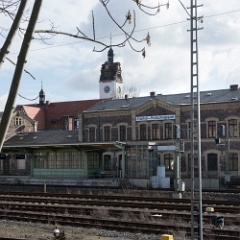 28 Ibis Bastei on the left and centre the Ibis Konigstein. 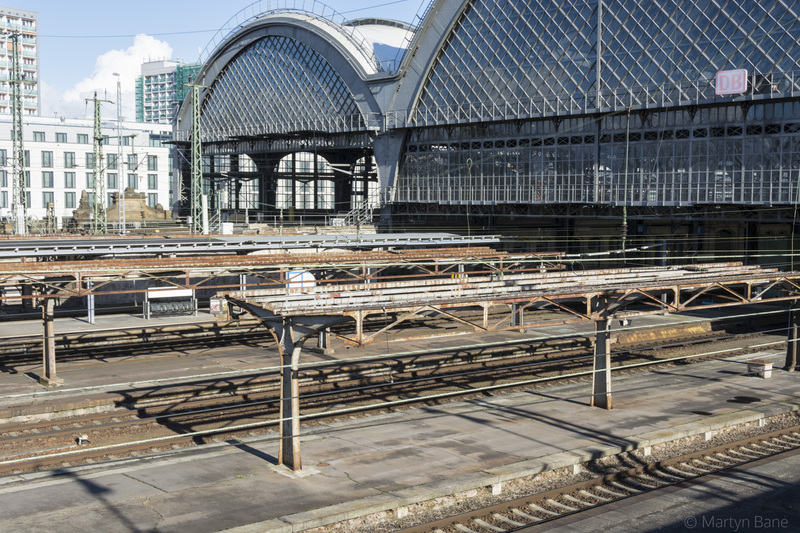 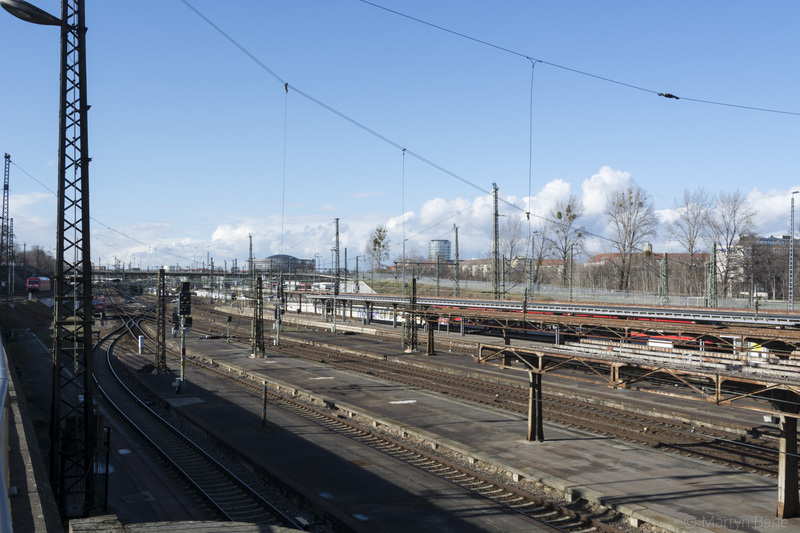 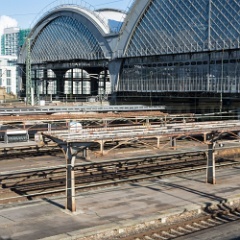 29 Dresden Hbf low level platforms, longer than they need to be for the trains now in use. 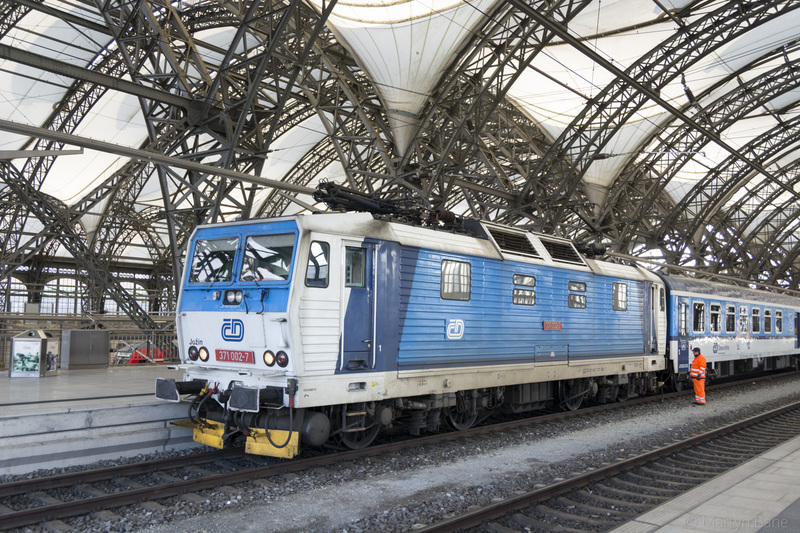 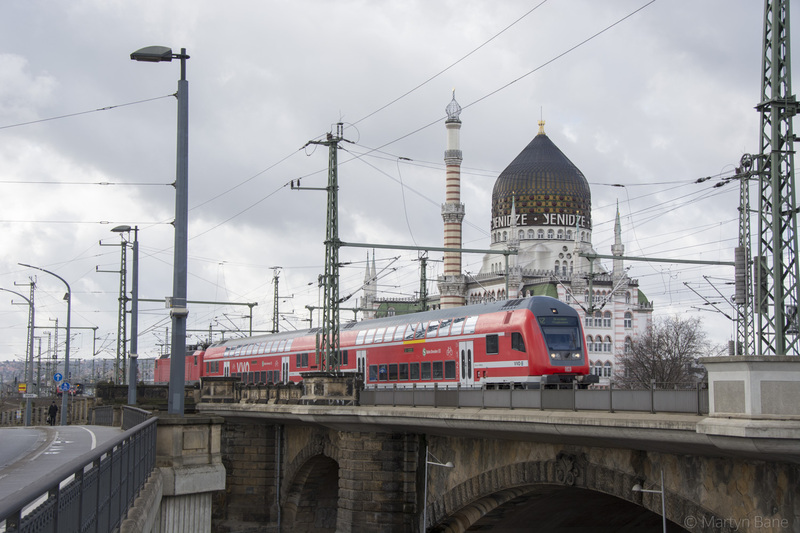 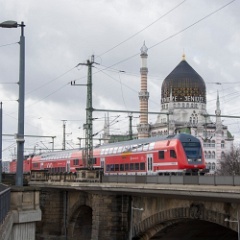 30 A DMU, which will head to Liberec in the Czech Republic, pulls into Dresden Hbf.